Citation: C N Trueman "Chemical Warfare and World War Two"
Developments in chemical warfare were to see new weapons – or more sophisticated weapons – by the end of the war in 1945. The use of chemicals led to more deadly weaponry being available to the infantry soldier – the most famous being the phosphorous grenade/bomb and the use of napalm. Phosphorous grenades/bombs (see photo below) were used as incendiaries with the sole intention of setting things alight. In ground combat, an infantryman could use a phosphorous grenade to attack a machine gun post. In an aerial attack, bombers could use phosphorous bombs to set buildings alight which would then act as pathfinders for squadrons of follow-up bombers which would the use high explosive bombs – as happened in the Blitz. Why was phosphorous so deadly? 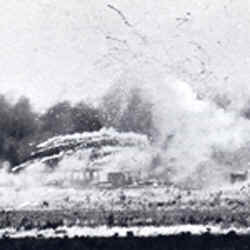 As a phosphorous bomb/grenade exploded, fragments of white phosphorous would be scattered over a wide area and the particles spontaneously exploded on contact with air. If these particles came into contact with skin, they had a tendency to stick and cause very painful skin burns with the almost certainty of taking someone out of a combat zone. If the victim was wounded, then looking after him/her would use valuable resources. An even more effective form of chemical warfare was the development of napalm. This jelly-like substance derived from palmitic and naphthalenic acids, was a high-efficiency incendiary material which burnt fiercely for long periods of time when compared to petrol. On contact with organic materials, napalm continues to burn with a violent intense flame – see photo below. Anybody covered with napalm faced the appalling prospect of becoming a human torch. In World War Two, napalm was used against soldiers in an entrenched position (such as a machine gun post) and also in a general capacity whereby it spread terror amongst those on the receiving end of an attack – and thus did a great deal to undermine morale. Whereas both napalm and phosphorous were used in World War Two, its infamous cousin, poison gas, though developed and researched in depth, was not.